Autumn is a beautiful time of year in Colorado with warm days and pleasant evenings. As the sun begins to set earlier and earlier, there is no reason to stop using your beautiful outdoor spaces that you’ve enjoyed throughout the rest of the year. That is why Outdoor Lighting Perspectives of Colorado is helping to support and promote National Outdoor Lighting Month throughout the month of October. Coinciding with the end of Daylight Saving Time (that occurs on Sunday, November 3rd), National Outdoor Lighting Month will be an annual consumer awareness effort to educate homeowners about the safety, security and lifestyle/property enhancements that outdoor lighting can add to their homes. To support the educational aspect of the campaign, a free guide on How to Choose An Outdoor Lighting Professional can be downloaded from the website. The guide provides helpful design tips on pathway lighting, up-lighting and grazing, outdoor living space lighting, deck and step lighting, and festival lighting. The Guide also provides helpful tips on product selection, installation guidelines, and on-going maintenance considerations. 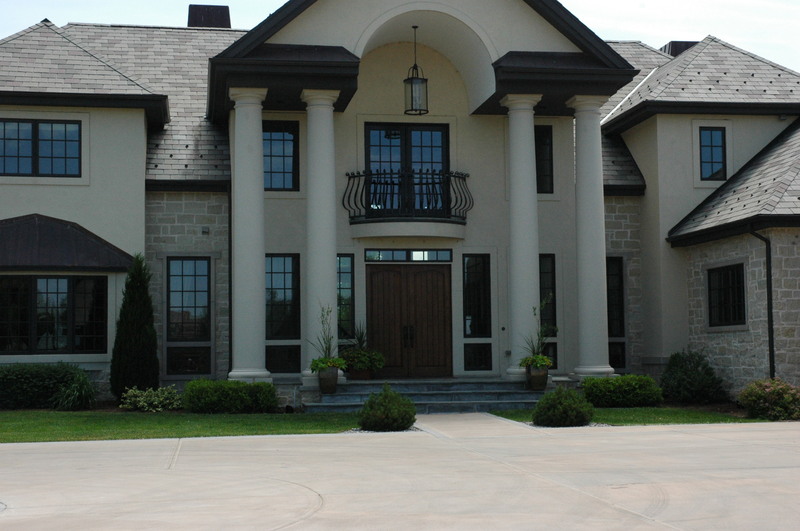 Outdoor lighting can also add to the curb appeal of any house this time of year. Anyone who has ever tried to purchase or sell a house this time of year can also attest to the value that outdoor lighting can bring to the real estate transaction. Which house will get noticed more – the house with only one carriage light or the one that is beautifully illuminated that basically says welcome home? You can read more about National Outdoor Lighting Month in a recent article in Turf Magazine. 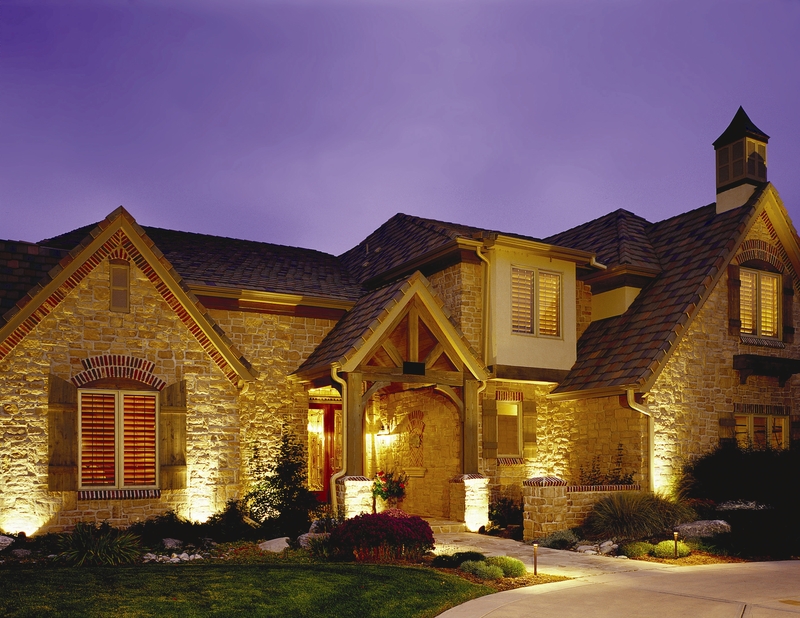 If you have any questions about lighting techniques or how outdoor lighting can add to the beauty and usability of your home, please call us at 303/948-9656. It seems like every new lighting design and installation has its own unique challenges, and some jobs have more than one. 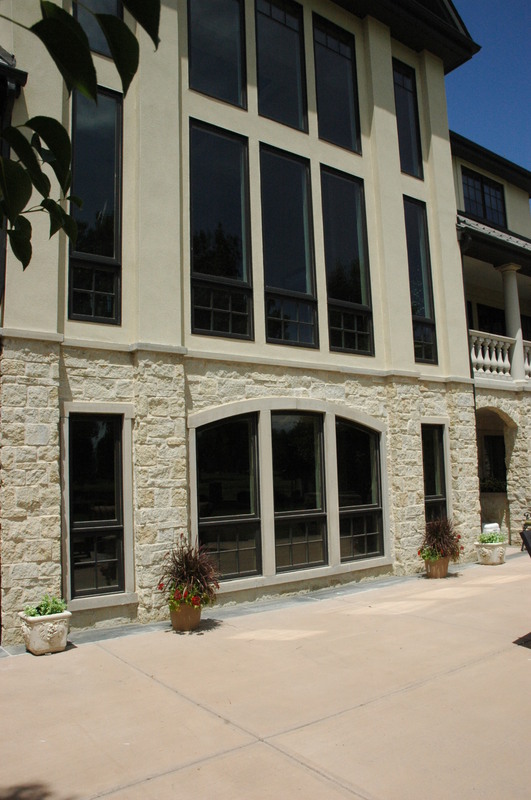 At this recently completed low voltage LED landscape/architectural lighting project in Columbine Valley, the homeowners of course wanted to uplight each of the four columns for dramatic effect. The inner two columns were easily uplighted with the Outdoor Lighting Perspectives BB-03 6W LED well lights with tempered glass lens covers – and those fixtures were mounted at ground level. However, it was not possible to use our standard ground-mounted well lights for the two outer columns since the shrubbery in those locations occupied the entire space in the planting bed. Fortunately, our company’s manufacturing facility recently released the newest fixture in our product line, the BB-02 6W LED, also known affectionately as the stick light. This barely visible fixture can be installed where no fixture has gone before, it can be custom manufactured to any height, and it is available with several beam spreads. 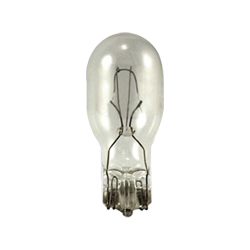 The best news of all is that the lighting effect from this fixture looks identical to our BB-03 6W PAR36 LED bulb/well light. In the back yard, we also encountered another dilemma for uplighting the four primary columns. 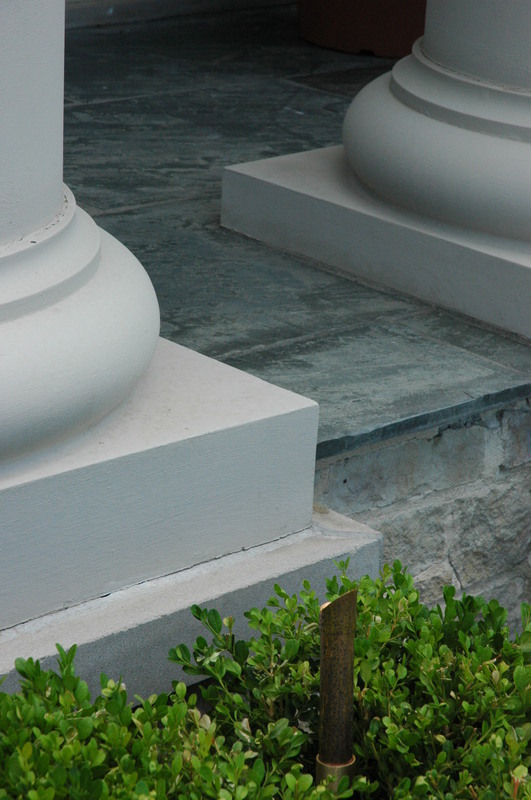 The area next to the columns was surrounded by hardscape and there was no pre-wiring of any kind. In new construction, we can coordinate the installation of lighting with the concrete/hardscape contractor so that the lighting fixtures can be flush-mounted and all of the wiring routed through pre-installed conduits. Fortunately, our experienced installers can typically find a way to install and conceal both the lighting fixtures and the wiring on a project where the hardscape has already been installed. 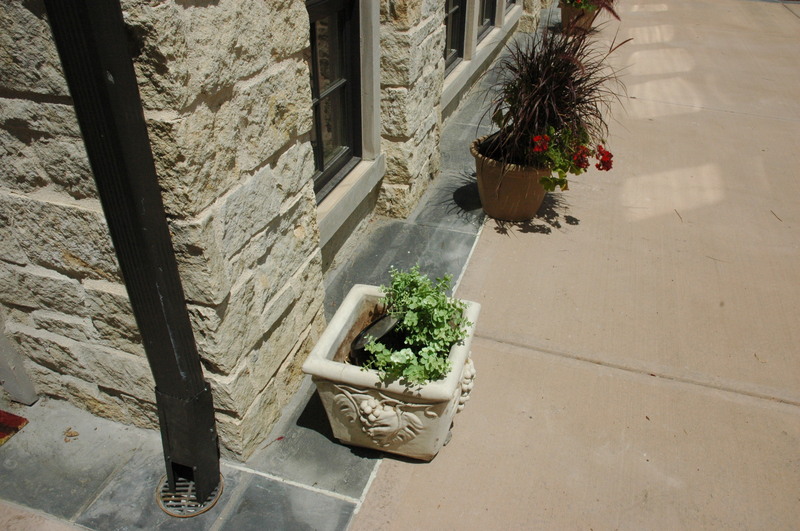 The easiest way to hide well lights if they cannot be flush-mounted into hardscape is to plant them like a plant in a flower pot. And yes, you can water and fertilize the actual plants in the flower pot without damaging the lighting fixture. That’s the easiest way to conceal the lights but how do you hide the wiring? The good news is that most extensive hardscaped areas have drains to channel the water out into the yard from the upper story of the house – and that’s how we were able to get the wiring to within 6-feet of where the lighting fixtures were installed. To run the wiring from the drains to the pots required grinding out grooves in the mortared joints and running the 18-gauge wiring to the lighting fixtures up through the bottoms of the flower pots. The wiring in the grooves was then held in place and sealed by using a high-quality caulk. How did you do that? We don’t see any wiring or anything disturbed on our property. All we see is the beautiful lighting effect. As the owner of a lighting company, that is one of the highest compliments that a customer can pay to our company and our installers. I certainly do not want to pick on landscapers, but one of the most frequently heard comments at the recent Colorado Garden and Home Show was – my landscaper did my lighting but it’s never worked right. During the last two weeks, I evaluated two lighting systems that coincidentally had exactly the same fixtures. The low voltage path lights were manufactured by a well-known national lighting manufacturer that had rolled out a lower-priced line of fixtures for landscapers to use. The path lights use the incandescent T5 wedge-base bulbs that have an average life of only 500 to 1,000 hours. In addition, the manufacturer states that these fixtures are rated for damp locations (somewhat sheltered from the weather) instead of wet locations (snow, rain, sleet, etc.). The fixtures have no lenses to protect either the bulb or the socket from moisture, moths, and spider webs – and that degrades the bulb life even further. Making the situation in both installations even worse is the fact that the installers used the daisy chain method of installation – that’s when numerous fixtures are connected in series one after the other on the same circuit. Invariably with that wiring technique, the installer typically sets the voltage higher than it should be to ensure that the light at the very end of the circuit receives enough voltage to light up. What that also means is that the first light in the series is receiving 14, 15, or 18 volts – and since the bulbs are only rated at 12V – the first bulb starts burning out very quickly causing a domino effect down the line. In one of the locations, the landscaper installed over a dozen step lights in poured concrete steps and patios – and it appears that no sleeves had been installed so that the system could be rewired if necessary. More problematic is the fact that as the concrete continues to cure over time, it will react with and break down the protective insulation and eventually corrode the wiring. Outdoor lighting systems can last a lifetime if high quality products are used and professionally installed – and it’s very disconcerting to see a beautifully landscaped yard with an inferior lighting system. Sometimes we can come up with a cost-effective solution for the homeowner to remedy the lighting system – but sometimes we almost have to start from the beginning. As with any home improvement project, homeowners need to peform their due diligence on prospective contractors (including landscape lighting) before any project is begun. Many homeowners ask why they should work with us and our response is typically “maybe you shouldn’t.” That response can be a bit disconcerting to most homeowners but almost immediately they understand the point we’re trying to make. And that point is that until you ask the right questions and receive the answers you’re comfortable with and do the background checks on a particular company or companies, you really should not be proceeding with any project until that due diligence is completed. BUSINESS LICENSING/REGISTRATION/INSURANCE? Is the business registered and in good standing with the Colorado Secretary of State’s office? Does the company have the appropriate state and municipal operational and tax licensing? Does the company carry the appropriate property and liability insurance? BBB RATING? Is the company listed as an Accredited Business by the Better Business Bureau and what is its rating? For example, Outdoor Lighting Perspectives of Colorado is listed as an Accredited Business by the Denver-Boulder Better Business Bureau and currently holds an A+ rating. HOW MUCH LIGHTING EXPERIENCE DOES THE COMPANY HAVE? Outdoor Lighting Perspectives (OLP) of Colorado has been operating since 1999 – and our national company has been operating throughout the country since the late 1980s and early 1990s. Lighting is the only thing we do day in and day out – so we have to be really focussed and good at what we do. As part of a large national/international company with over 60 offices, we receive frequent and on-going training with respect to the latest lighting products and technology, design and installation techniques, and customer service. Interestingly, about 85% of the lighting companies operating in the Denver-Boulder area in 2001 are no longer in business. HOW MANY LIGHTING INSTALLATIONS HAVE YOU DONE? The old saying is that anyone can sell you lights, but not everyone can provide you with an effective and high quality lighting installation. The number of installations a company has done is directly related to their level of expertise and professionalism in being able to handle any type of project. OLP of Colorado has close to 1,500 installations under its belt – from the plains of Fort Morgan to a two-mile high mountain-top and all along the front range of Colorado. Companies who only do lighting as a sideline business typically never get close to us with the breadth and complexity of the jobs we tackle. CAN THE COMPANY PROVIDE REFERENCES? Good and reputable companies should never be reluctant to provide reference sites to prospective clients. However, from a lighting design standpoint every homeowner has different tastes and even different budget ranges in mind. That’s one of the reasons that we provide the free evening lighting design demonstration so that every design is customized for each homeowner. WILL THE COMPANY PROVIDE A PREVIEW? As a follow on to the previous topic, any good lighting contractor should be able to provide you with an evening design demonstration so that you can see what the system will look like prior to the installation. WHAT WARRANTIES COME WITH THE SYSTEM? Obviously, warranties are only as good as the company that backs it up. We once had a prospect (now a customer) who had asked one of our competitors “whose lifetime?” when he spotted their “lifetime warranty” banner hanging somewhat precariously in their exhibit. As I mentioned above, most of the lighting companies in business locally in 2001 are no longer around. 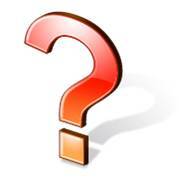 ASK ABOUT THE COMPANY’S SERVICE/MAINTENANCE PLANS Do they provide service after the sale? More often then not a lot of homeowners find out too late that the company that installed their lights provide no help after the installation. FIND OUT WHO DOES THE ACTUAL INSTALLATIONS Does the contractor have their own factory trained employees or do they pick up day-hires with limited on-site training? Do they provide workmans comp, etc. Do they only hire and employ workers who are in the U.S. legally. WILL MY LANDSCAPING AND SPRINKLER SYSTEM BE DAMAGED? Reputable and experienced lighting contractors should leave your property as good or better than it looked before the lighting installation was started. One of the best compliments our crews receive at the end of the day from a homeowner is that it looks like they had a lot more work to do since they didn’t notice any disruption to the landscaping. And that’s the entire point – the homeowner should not see anything different about the landscaping except for the fixtures as well as the beautiful illumination in the evening. All of our trenching is done by hand with thin slices in lawn areas. After the wire is buried, the sod folds back over and most homeowners cannot tell where the wiring had been run. With regard to sprinkler systems, occasionally one of our crews does cut a line but it is our responsibility to fix it. If the sprinkler system is more complex than what we’re experienced with, we can call in one of several irrigation companies to complete the repairs. Of course there are many more questions that homeowners can and should ask with respect to contractors in general and lighting contractors in particular, but hopefully I’ve addressed the primary questions today in this short blog.